The memories require the Ashen Mist Heart to access them. The memory of Jeigh recalls the fall of the Giant Lord by an unknown warrior. The Giant Lord is the king of the Giants that invaded Drangleic. This towering monstrosity came to the fight complete with his crown and massive Greatsword. He seeks vengeance for the subjugation of his kingdom and intends to reclaim a precious prize stolen from him by King Vendrick, but what could this "prize" possibly be…? The memory of Orro recalls a battle within the Fort at the Forest of Fallen Giants. The Giants had fought there way deep into the Fort. Benhart of Jugo resides within this memory. How he came to be in there is unknown, though he perhaps obtained the Ashen Mist Heart as well. The memory of Vammar recalls a battle within the Fort at the Forest of Fallen Giants. 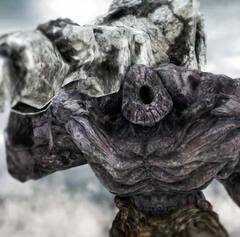 It appears to take place not long before the Giants were finally defeated, after bringing Drangleic to ruin. Captain Drummond can be found lying amongst a pile of rubble beside his dead soldiers. He appears to be mortally wounded, and will give you his helmet if you have defeated the Giant Lord. Royal Solider: A living and healthy albeit battle-scarred and exhausted soldier of the Drangleic Army. Under the command of Captain Drummond, they defended the fort against the invading Giants. Many of those who died during the battle rose again as Hollows and have continued to watch over the fort to this very day. Royal Infantry: Enlisted infantrymen of the Drangleic Army, these brave but lightly-equipped men are weary from battle and suffering waning morale. They are found locked in combat with the Giants in several locations throughout the memories and may also misidentify visitors as a threat. Giant: A member of the race of Giants first conquered by King Vendrick and later responsible for a vengeful counter-invasion of Drangleic. Giant soldiers specialize in several different types of combat and can be differentiated by their appearance. The Ancient Dragon Memory recalls the world on the cusp of the Age of Fire. The world still consists of grey crags and archtrees, but the archtrees are broken and this everlasting dragon is defeated. The Memory of the King recalls Vendrick's last moments of life before hollowing within the Undead Crypt. Vendrick sits on the floor and seems dejected. He urges the Player to seek the crowns of those below, to seek adversity. When all three crowns have been gathered, he will instill in them new properties. The Memory of the Old Iron King recalls the fall of Sir Alonne. The Old Iron King does not appear to be within this memory and it is accessed by obtaining the Crown of the Old Iron King and the Ashen Mist Heart. received from the ancient dragon. to delve into the memories of the withered. grow darker with each passing day. and became the King's most trusted knight. who served the Old Iron King. lord, and helped him become the Old Iron King.